The Financial Report Painter is a feature of Report Painter, from which it is accessed. You start a report in Report Painter and complete it in the Financial Report Painter. Report Painter retains control over report-wide and column-oriented properties of the report, while the Financial Report Painter controls the row-oriented properties. However, you can access key Report Painter dialog boxes (particularly the Report Options and Field Properties dialog boxes) directly from the Financial Report Painter, making it easy to control many report and column-based properties without switching tools. Add the fields you want to include in the report, including the field that you intend to designate as your FOR field. The FOR field will allow the report to be structured on a row-by-row basis in the Financial Report Painter. You can include vertical (BY) and/or horizontal (Across) sort fields, however, these fields are not required. They are frequently omitted from financial reports where sorting is controlled by the placement of FOR field values in the matrix. Nevertheless, you can include both BY phrases and Across phrases in the request. You may add any of the following report elements as required: headings and footings, totals, subtotals, calculated values, and images. Select the field that you want to use as the FOR field, and click the For button on the Report Painter Columns toolbar. A report request can only contain one FOR field. Click the Matrix tab at the bottom of the window. The Financial Report Painter Design matrix opens. Tip: If you want to return to Report Painter, click the Report tab below the matrix or choose Show Report Painter from the View menu. To reopen the Financial Report Painter from Report Painter, click the Matrix tab. In this example, an Income Statement is open in Report Painter. 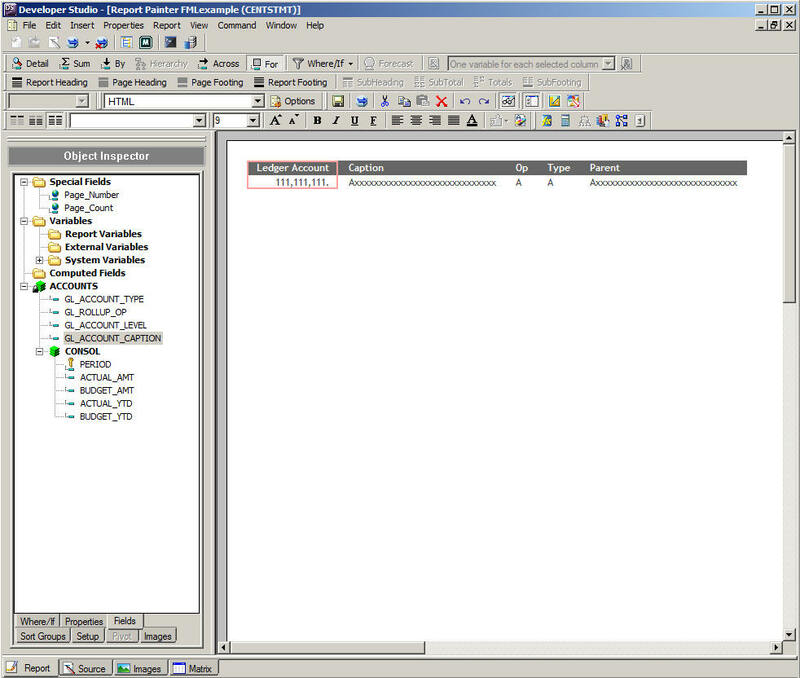 A heading is defined and the report columns are specified. Ledger Account is designated as the FOR field and the For button is selected on the Report Painter Columns toolbar. The next step is to click the Matrix tab below the Report Painter window to open the report in the Financial Report Painter. For an illustration, see Designing Your Financial Report.